This is one of those recipes that took me forever to get right. You’d think muffins would be easy to whip up. But I wanted to make these muffins packed with protein, so I had to make a few adjustments. The biggest adjustment was replacing flour with rolled oats, because oats are richer in protein than wheat flour. (Oats are also slower to digest, so they make you feel fuller longer.) But because of the lack of flour, this meant adding extra eggs to make the muffins fluffier. Another great thing about substituting oats for flour is that oats are gluten-free! If you’re on a gluten-free diet, just make sure to use pure gluten-free oats that don’t contain wheat or rye. In addition to the extra protein from the oats and eggs, I also add plain Greek yogurt (a great low-sugar, high protein resource) and a scoop of protein powder. 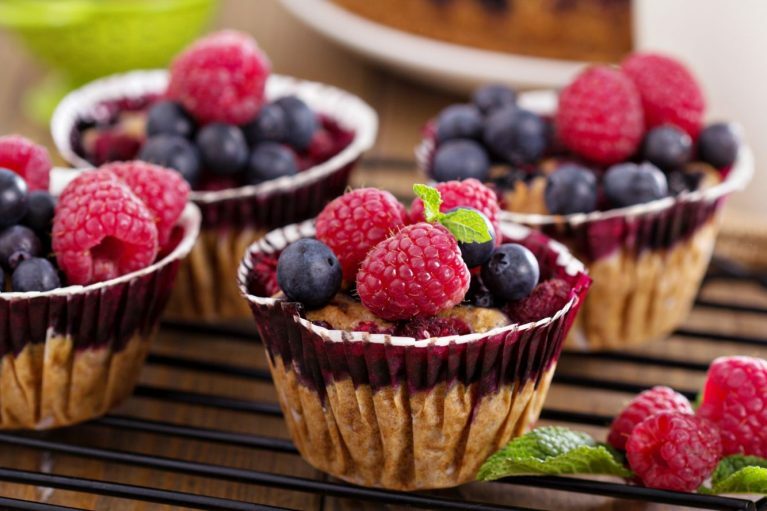 I love to add a mix of blueberries, blackberries and raspberries for these berry protein muffins. Feel free to use your favorite berries… I just wouldn’t recommend using strawberries. They tend to turn white and lose flavor while baking. 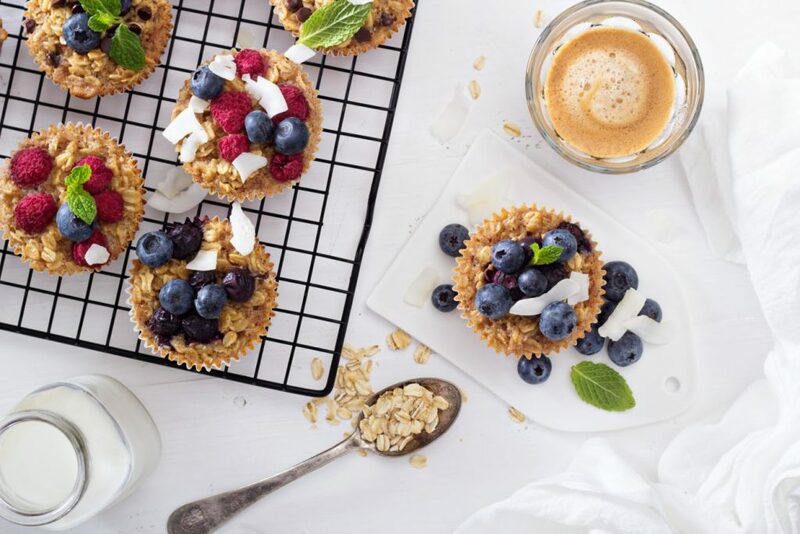 Place ¼ cup oats in a blender or food processor and blend until they reach a flour-like consistency. Add banana and egg and blend again until smooth. Pour mixture into a bowl and stir together with the rest of ingredients, except for berries, until smooth. Pour muffin mix into baking cups or lightly greased muffin pan. Bake for about 20 minutes until top of muffins are firm.